itzcaribbean Usain Bolt competition winners at Madame Tussauds. Usain Bolt was commemorated this week with his very own wax work and itzcaribbean was there to witness the special event. We arrived at dawn and were quickly ushered up to the private room where the life size figure was displayed in his iconic ‘To Di World’ pose. Towering over us at a huge 6ft5″ the 5 time world and 3 time gold medal champion was a sensation in wax as we donned his national flag and joined the figure centre stage for the worlds press. 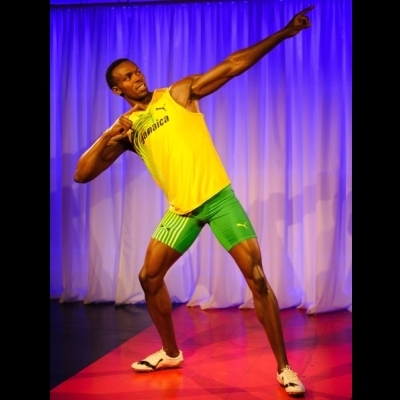 The Jamaican sprinter was then moved to Madame Tussauds Interactive Sports Zone, where he joined other models like Tom Daley and Jessica Ennis and looked right at home with a painted stadium behind him. The models reported to have taken 4 months to replicate with 12 people working hard to make it as realistic as possible costing an estimated £150,000. Usain unfortunately couldn’t join us for this special event but he has been shown a picture of the final figure and is said to be ‘very pleased with its outcome’.